Following the takeover of bmi British Midland by International Airlines Group and its integration into IAG’s British Airways, former subsidiary bmi Regional has begun the process of establishing itself as an independent carrier. New owners, Aberdeen-based Sector Aviation, have announced routes linking Scotland’s oil capital with Bristol, and Manchester with Antwerp. Service will commence with the launch of the Winter 2012 timetable. 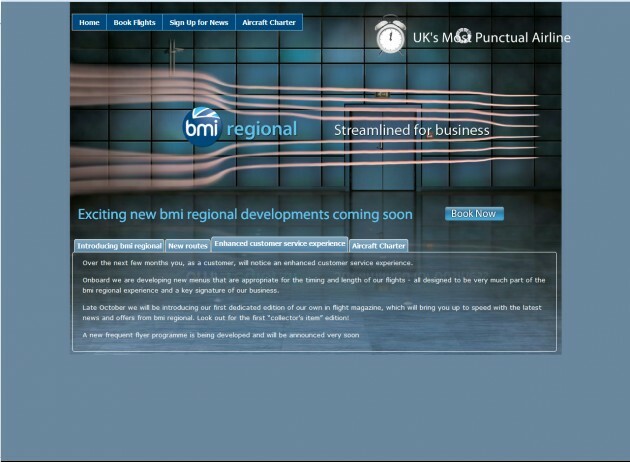 A new website at www.bmiregional.com is also live, providing first details of the airline’s plans – including the development of a new frequent flyer programme to replace the Diamond Club. The keen-eyed will notice a tweak to the bmi branding, which now includes a stylised Union Flag quadrant, and the launch services will be the fist to carry the airline’s new and unique designator: ‘BM’. For more information and to sign up to further updates, visit bmi Regional. Cutting corners so early in this narrative could easily be considered a very poor way to begin; a far from encouraging introduction that is unlikely to enthuse the reader and prompt further page-turning. It does however seem somewhat pointless recounting the fun endured on at least the first part of this journey, as bmi has finally achieved its long-held goal of cancelling forever their service between the capital and the former RAF Goosepool, more recently known as Tees-side and now Durham Tees Valley Airport. So, since they no longer fly there, neither will you, and you need know more. Suffice to say: no carry-on luggage allowed, no jetty at LHR, no bus to terminal, no lift or escalator to arrivals level and a gate so far from anywhere at ‘T1’ that it might just as well have been called ‘Slough’. It’s true that the bmi service between Heathrow and Schiphol remains, but rather in the manner of a dry, nagging cough that refuses to shift and annoys both the throat it travels and all those around. In fact, service, is perhaps too strong a word. Very much in the manner of previous US Airways experiences, we took off, nothing happened and we landed – with a few scowls thrown around for interest. The scowls appeared to be free for Gold & Silver Diamond Club members, but I rather had the feeling that us ‘Blues’ were paying for them. There was certainly plenty of time for a few more grimaces pre-disembarkation, as the Airbus A319’s taxi from the Polderbaan to the terminal took very nearly as long as we’d spent aloft across the North Sea. Forgettable in every way – but also 80% cheaper than a one-way Teesside to Amsterdam with KLM, so I suppose the scowls were reasonable value. Final Verdict for bmi Domestic and European Economy Class: ?.?/?.?. Unable (or unwilling) to remember anything about them, so scores not available.